NETWORK FINALS: There were no changes from Thursday’s preliminary ratings. CABLE HIGHLIGHTS: TNT’s NBA doubleheader led Thursday cable, with the early Golden State vs. Houston game at 0.95, and the late Clippers vs. Oklahoma City at 0.64. A&E’s 60 DAYS IN made its Thursday debut at 0.43, after lead-in THE FIRST 48 returned at 0.36. It was another big night for MSNBC’s segment of cable news, and its RACHEL MADDOW SHOW was on top at 0.39/0.58/3.2M, above Fox News’s HANNITY at 0.31/0.51/3.1M and CNN’s ANDERSON COOPER 360 at 0.29/0.39/1.5M. 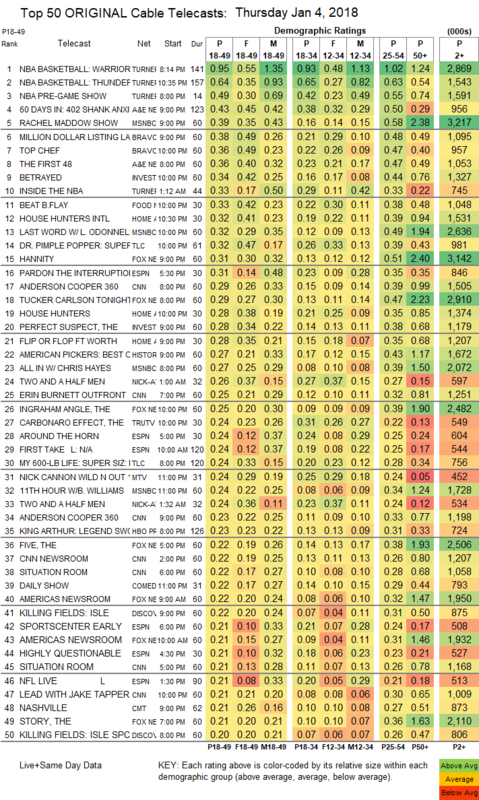 On Bravo, MILLION DOLLAR LISTING gained 0.07 to 0.38, and TOP CHEF was up 0.04 to 0.36. On ID, BETRAYED premiered at 0.34, and THE PERFECT SUSPECT ticked down to 0.28. Food Network’s BEAT BOBBY FLAY rose 0.09 to 0.33. On HGTV, HOUSE HUNTERS INTL was at 0.32, HOUSE HUNTERS was at 0.28, and FLIP OR FLOP was also at 0.28. Tru’s THE CARBONARO EFFECT gained 0.05 to 0.24. MTV’s WILD N OUT ticked down to 0.24. Discovery’s KILLING FIELDS was at 0.22/0.20. CMT’s season premiere of NASHVILLE was at 0.21 (note that we won’t have ratings for the TV Land 10PM airing until Monday). Lifetime’s PROJECT RUNWAY ALL-STARS returned at 0.19. USA’s DAMNATION fell 0.05 to 0.16. On Syfy, the season finale of VAN HELSING slipped 0.02 to 0.14, the season finale of GHOST WARS lost 0.02 to 0.09, and SUPERSTITION ticked down to 0.07. 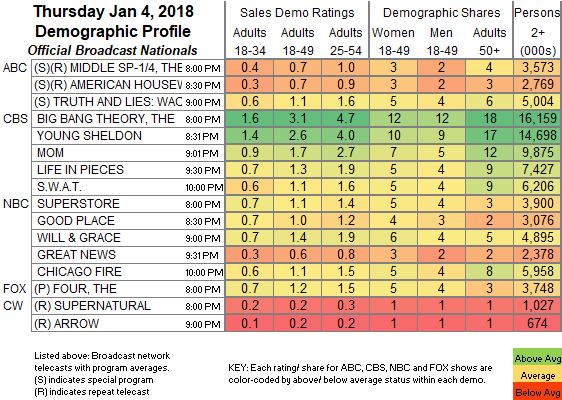 POP’s IMPACT WRESTLING was up 0.02 to 0.07.